“Climate change made [insert any wildfire] worse” is probably a headline you’ve read in the past week or so as major media outlets race to link wildfires from California to Greece to global warming. It’s only the latest media fad this summer, which has been particularly hot and dry in parts of the world. Record heat in Europe, Japan, the U.S. and elsewhere was linked to man-made warming, now wildfires are getting the same treatment. First, media outlets, joined by activists and some scientists, attributed wildfires raging across Greece to global warming, despite the actual data pointing to a decline in burnt area across Southern Europe. Mirroring coverage of California’s deadly 2017 wildfire season, news outlets are linking fire outbreaks in Northern California to global warming. “How climate change is making disasters like the Carr Fire more likely,” is the latest wildfire headline from The Washington Post’s Capital Weather Gang. The Carr Fire in Northern California spread astoundingly fast, hitting more than 100,000 acres as of Tuesday. Firefighters have contained just 27 percent of the blaze, which is the largest in the state. But the Carr Fire is only one of 17 wildfires raging across the state that have turned hundreds of home into cinders and killed at least five people. “What remains a critical question is how climate change affects the winds that cause wildfires to spread,” WaPo writer Angela Fritz added. But this over-simplifies the situation. Wildfires are a complex interaction between climatic conditions and human land management — logging, thinning and other activities to reduce fuel loads. Wildfire experts say human land management practices and encroachment of development into wildfire-prone areas overwhelms any signal from global warming. Most fires are in fact cause by humans. The Carr Fire, for example, was caused by the “mechanical failure” of a vehicle, officials said. Earlier this year, California authorities announced that 12 major fires that raged across wine country last year were caused by “electric power and distribution lines, conductors and the failure of power poles,” not global warming. Indeed, the National Academy of Science’s 2016 document on climate attribution studies found that while scientists have a “high” understanding of global warming’s impacts on extreme heat, there was a “low” understanding in regards to wildfires. 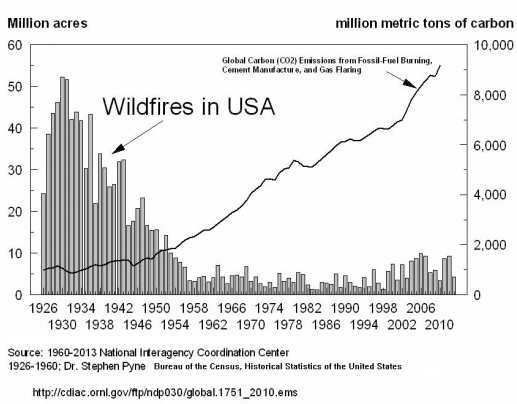 Professor David South of Auburn University, a wildfire expert, showed just how messy attributing wildfires to global warming can be given the massive downward trend in U.S. wildfires since the 1930s. “For the western USA, they indicate little change overall, and also that area burned at high severity has overall declined compared to pre-European settlement,” the study found. Using satellite images, NASA scientists noted a 24 percent drop in global land are burned from 1998 to 2015. Most of the decline happened in savannas and grasslands due to shifts in livelihoods away from subsistence agriculture. Most interestingly NASA scientist found the change in human activities dwarfed the increased risk of wildfires from global warming. While some northern latitude areas have seen an increase in fires, the change in management of savannas and grasslands puts the global burned area in decline.